Sanya Phoenix International Airport last Sunday welcomed its 11 millionth lucky passenger after the landing of flight PN6213 from Chongqing to Sanya, making another record high for the passenger throughput this year. In recent years, Sanya Airport’s active participation in the star rating program of SKYTRAX and a variety of service evaluations had a positive effect on the rapid growth of visitor traffic. The airport had set a new passenger traffic record in 2011 and hit a 10 million throughput for the first time. The figure is expected to continue to hit 12 million in 2013. Aside from this, the Sanya government has introduced a subsidy policy to encourage new flights and routes to Sanya, which helps promote the city’s booming air travel market. The government began to subsidize airlines running international flights to/from Sanya since 2007 and has appropriated up to 600 million yuan as of this month. 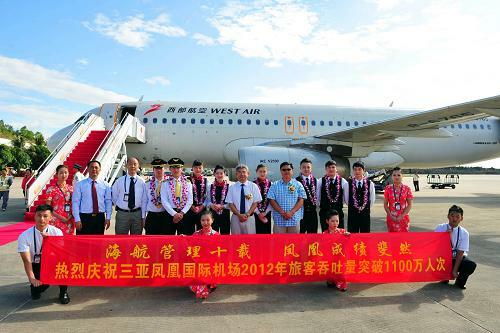 To date, the Sanya Phoenix Airport has added flights to 9 cities including 5 domestic routes and 4 international routes.